wow. one of my favorite, quick mediterranean places ... i'm shocked i've never posted on them before!! okay ... here it is : baba pita in the west loop. a really lovely lunch spot. well, to be honest. i've never eaten at the restaurant. but it's good for pick up or delivery, for sure. anywho ... here's what baba pita has to say for themselves : "looking for a quick lunch or perhaps an exquisite vegetarian meal? healthy & tasty dinners with multiple courses, lively colors blended with savory & contrasting flavors, yet healthy & light, middle eastern cuisine could be the best option for you." see what i mean? 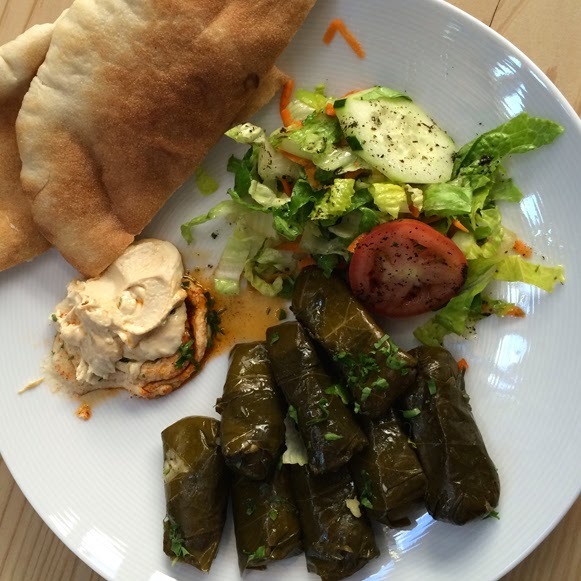 grape leaves stuffed w/ seasoned rice, fresh lemon salad, hummus & pita bread. i've gotten the same thing from baba pita for the past four or so years ... always high-quality & just generally tasty. you can't go wrong. there's been a mishap with a change in the hummus recipe in the past (but they got back on track) ... & a moment with some miscommunication on the vegan-ness of the lentil soup (not.at.all. vegan or vegetarian), but besides those little snafus ... i'm telling you -- the most consistently good mediterranean food. two very enthusiastic thumbs up.